Since early March of 2009, stock market has been on a tear. We have been told by the BS artists who work and show-up as guests at CNBC etc that the economy is on the track for recovery. The $700 billion bailout to ‘recapitalize’ banks, the massive stimulus bill and the $23 trillion tax-payer back-stop for banks’ credit derivatives exposure has prevented a complete collapse. To top that, there have been reports that the Fed has been propping the mortgage markets by purchasing MBS with precise timing – i.e 86% of purchases coming during the week of options expiry. If you believe that this is a coincidence, I want to sell you Nagarjuna Sagar Dam. 15 stocks in the S&P 500 have a P/E over 100. 23 have a P/E over 60. 37 have a P/E over 40. 65 have a P/E over 30 and 152 have a P/E over 20. 220 – nearly half – have a P/E over 13, the historical long-term average. The latter statistic is trotted out from time to time to claim that the market as a whole isn’t overvalued, but 125 stocks in the S&P 500 have a negative P/E – that is one quarter of the S&P 500 has negative earnings. In the NDX (Nasdaq 100) believe it or not there are 13 stocks with a P/E over 40. But 39 have a P/E over 20 and 21, or 21%, have negative earnings. From what I read and see, the fundamentals of the economy have not improved. Companies cut all the cost they can to improve profitability. Very few are hiring. Those who are gainfully employed (other than the Wall Street fat cats) are facing furloughs or pay-cuts and/or benefit cuts. This list includes a tenured professors at State educational institutions like me. Stimulus money is running out. Investment bankers, traders have colluded enough to run short-sellers out of business. The market is no longer even the pretend free-market it once was. For several months, it has been heavily manipulated by the Feds and the influential trading firms on Wall Streets. Now what? Looks like on Friday the market averages retreated to a technical support level (holding the 11-month uptrend line.) 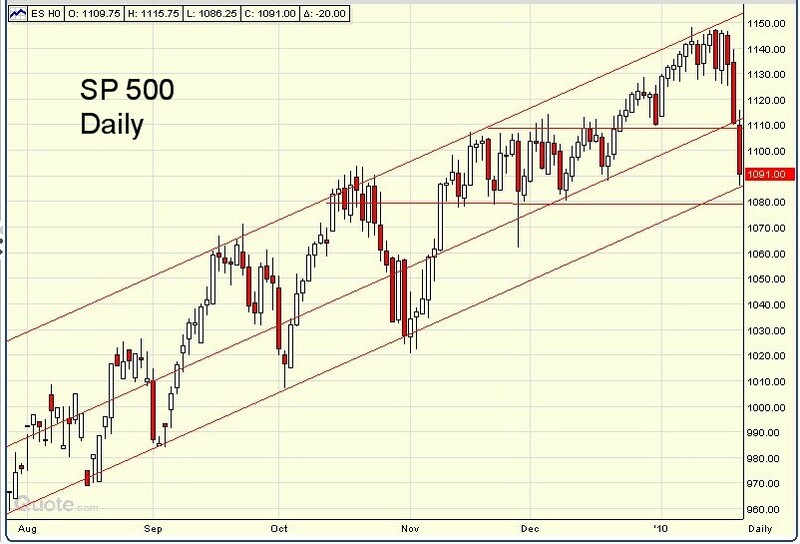 The markets may be due for a short-term bounce. But I do think that this may be the beginning of another steep slide in the market. As goes the stock market, so goes the economy.